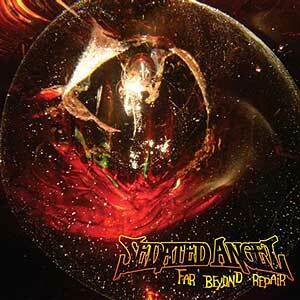 Sedated Angel - "Far Beyond Repair"
Sedated Angel, a band from Denmark, are back with their third full record. This one is released on vinyl as well as CD with some super cool and strange graphic art. The band is the only band in Denmark playing psychedelic stoner rock at this time with powerful dual guitars. Cemetery gives you a good overall feel for this CD with a cool opening psychedelic stoner rock opening. Expanded Horizon is a dark more doomy track but also with some psyched out parts. Drug Shovel is a more bluesy track and a nice change of pace. Could Never Leave begins with a nice slow spacey beginning with a strummed guitar and laid back vocals. It builds up and also includes some Hammond organ as they go into a psyched out jam. Very cool stuff. Fire in my Eyes takes the pace up again with a nice melodic groove rocker which the band mostly jams out on. Black Suit has some cool delay vocals that give it a bit more of a psychedelic flavour in this slowed down and heavy stoned rocker which rocks out at the end. 1000 Times features the bands dual guitar approach to stoner rock. Fly Away has a very cool groove and some nice psyched out parts as well. The CD ends with Longest Time and is one of the best tracks with a lot of jamming and the return of the Hammond. Damn cool band and great third CD.